Origin's new "Game Time" initiative means that you can get a full 48 hours of time with Titanfall for free. Origin has just unveiled its new "Game Time" initiative, where gamers can play a game for a set period of time for free, and its kicked it off with arguably the biggest game in its library: Titanfall. The concept may seem familiar to anyone who's experienced Steam's "free weekends," but unlike Steam, in which a game is made "free" for a specific period of time, with Game Time, your "free time" only starts ticking the first time you boot up the game. That means if you first boot up the game on Sunday evening, you'll be able to play until Tuesday night. To get started, just head over to Origin's free games page and add the title to your account. Furthermore, if you decide to purchase the game after your Game Time runs out, you'll get to keep all of your unlocks and progress. 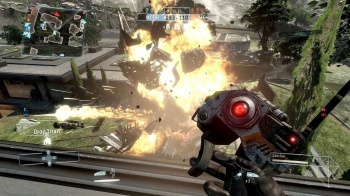 "Titanfall is only the beginning for Game Time and there's more on the way," teased EA. "Each Game Time will be unique: different game, different time on the Game Time clock. We'll keep you posted on Twitter and Facebook when your next Origin Game Time game begins." Titanfall, while ultimately failing to live up to the hype (how could it?) is still a fun, deathmatch-style shooter. If you were on the fence about picking it up, what a better way to make up your mind than playing it for two days for free? They say that imitation is the best form of flattery, and while Origin has been known to imitate Steam in the past, this is actually an example of it taking a Steam policy and actually making it better. Between initiatives like this and the on the house program, could Origin finally be setting itself up to be a worthy rival to Steam?